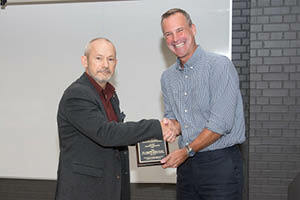 Tuesday, September 26th was “Awards Day” in the Department of Clinical Neurological Sciences. Every fall, the Department honours residents and faculty members for their accomplishments over the previous year. 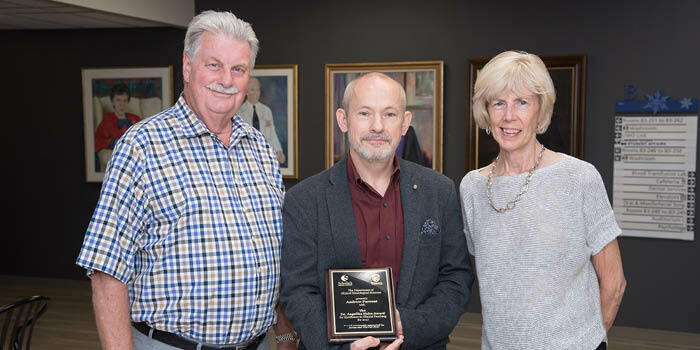 Dr. Chris Watling, Associate Dean, Postgraduate Medical Education and Professor in the Department of Clinical Neurological Sciences, presented awards for Best Resident Grand Rounds Presentations for 2016-2017 as well as the Angelika F. Hahn Award for Excellence in Clinical Teaching. Dr. Nevena Markovic, who has since joined the Department as an Adjunct Professor, took first place for the Best Resident Grand Rounds Presentation in Neurology for her presentation on “Posterior Ischemic Optic Neuropathy” with Drs. Warren Berger, Lauren Mai, and Adrian Budhram tied for second place with their respective presentations on “Multifocal Motor Neuropathy”, “Infantile Spasms”, and “HSV Encephalitis Mimics”. Dr. Faizal Haji received the first place award for the Best Resident Grand Rounds Presentation in Neurosurgery for his presentation on on “Hematomyelia”. 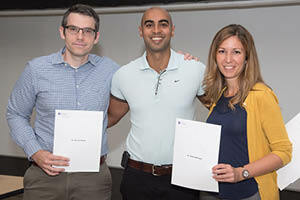 Dr. Abdul Naeem received second place for his presentation on “Subdural Hematoma from Aneurysm” and Dr. Amparo Wolf received third place for her presentation on “Traumatic Spinal Cord Injury”. Dr. Watling then presented the Angelika F. Hahn Award for Excellence in Clinical Teaching. This award was established in 2012 to honour Dr. Angelika F. Hahn’s contributions to the clinical education of a generation of neurologists. It is awarded annually to a clinician who has displayed excellence in clinical teaching in the neurosciences. The award is sponsored by James and Harriet Ross. James was a patient of Dr. Hahn’s for several years over which time they became very good friends. As a clinical teacher, Dr. Hahn’s legacy is one of unwavering passion for clinical neurological science. Over decades, her example inspired students and colleagues by her emphasis on a detailed neurologic history, where attentive listening and strategic questioning lead toward a diagnosis; by her elegant, skilled neurologic examination; and by focused laboratory investigations guided by current scientific knowledge. Underlying her exacting standards and her demands for excellence was her dedication to students and residents and her desire to see them reach their full potential.